When Sharp goes awry, when Extra Sharp earns a pucker, Seriously Sharp is born. It never tastes the same from one batch to the next. It's a cult thing...the cheese we used to sell to hunters and truckers...on their way out of town. 1. In medium bowl, whisk together eggs, half-and-half and vanilla. Add bread slices, turning to coat with mixture, and set aside to soak. 2. Melt 1 tablespoon of butter in small skillet over medium-high heat; add apple slices and shallot or onion and cook until tender. Add vinegar and cook for one minute longer. Remove from heat and set aside. 3. Melt remaining butter in large skillet or griddle over medium-high heat. Remove bread slices from egg mixture (discard remaining egg mixture) and cook in skillet for about two minutes on each side. 4. Layer cheese, ham and apple mixture evenly over two of bread slices. Top with remaining two bread slices. 5. Cook for one minute or until golden on underside. Turn sandwiches over and cook for one minute longer, or until sandwich is golden on second side and cheese is melted. Cut in half and serve warm. I love serving it to people for their first time. The comments I receive are "wonderful " "great" "where did you buy this"
we use it for snacking with crackers, in casseroles, toasted cheese sandwiches with additional cheeses, cheese boards with other cheeses. everyone we have introduced this cheese to has just loved it. my husband grew up in new England and that is how I was introduced to it. 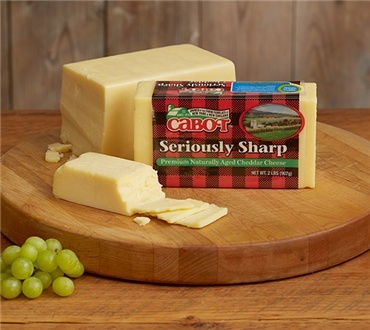 I lived in washinton state so Tillamook was my cheese of choice until Vermont cabot stole my heart! Great for anyone who is lactose intolerant. I love this cheese and would definitely buy again! Love this cheese - looked all over Northern California and could not find! Finally broke down and ordered! It is some of the best extra cheddar cheese - love it in my Mac and cheese, melted on toast, in grilled cheese sandwiches or just slice a piece and eat!